Take the Lead provides 3 types of Board & Train experiences-take a look and contact us HERE so we can find the right solution for you! Want to know more? Visit our Facebook Page by clicking HERE to see daily video and photo updates of our Board and Train dogs! Out of control German Shepherd learns how to be calm, tuned in, and focused! Stubborn puppy learns to tune in and listen! Take the Lead's Two-Week Obedience Board and Train experience is our most popular program! It's an intensive lifestyle program that is effective by immersing your dog 24/7 in our training routine, which includes daily doses of structure, rules, socialization, and supervised play. This is a great option for owners who are looking for excellent obedience (under high levels of distraction) and to improve their canine-human relationship, but are not dealing with serious behavioral issues (see the 3-5 week program for more intense dogs). By living at my home for 2 weeks, your dog will develop a new foundation and state-of-mind that will make it easy for you to continue the training at your home. This will empower you to continue developing a new and incredible relationship with your dog in lots of new an exciting places! Hyper Lab learns to be calm and polite! We specialize in state-of-the-art, low-level, communication-style E-Collar training. Our E-Collar program is nothing like you have ever seen, and is nothing like the E-Collar training of old. Contemporary E-Collar Training utilizes the softest, most gentle remote communication, and is one of the most humane and effective approaches to dog training available. No more pulling, gaging, barking, and jumping! Flash is off leash trained, calm, and obedient! This program includes a 30-minute consultation on our starting day, a 2-hour follow-up at the end of the program where we will transfer all of the information, techniques, and strategies to you to insure continued success. Each dog receives a top-of-the-line Educator E-Collar, as well as a prong/training collar. If you are curious about what a day in the life of a Board and Train dog looks like, make sure to check out my Facebook page! I post many photos, videos, and training tips daily of the dogs that are in training! Make sure to fill out the contact form to get your dog's training started! Video of a behavior modification board and train with an aggressive boxer. This is the only package I offer for dogs that have attacked a person or other animal, bitten humans or other animals multiple times, has intense resource guarding, or intent to do harm (including fear-aggression). In addition, dogs who display severe/debilitating fear, anxiety, or OCD reactions are best served in the rehabilitation program. Please contact me so that we can discuss the severity of your dog’s aggression so to create a program fit for your dog. It can take a few days, or up to a week for an aggressive, anxious, or fearful dog to begin to trust in leadership, rules, and boundaries–this starts by removing them from their environment and starting them on a fresh slate in a structured home, with a balanced pack. A Board and Train is the only way to truly change all of the variables to start reshaping your dog’s state of mind. In addition to all of the basic skills and commands listed in the Two-Week Obedience Program (above), this program includes a 30-minute consultation on our starting day, a 2-hour follow-up at the end of the program where we will transfer all of the information, techniques, and strategies to you to insure continued success, and a final 1-hour follow-up one to two weeks later. 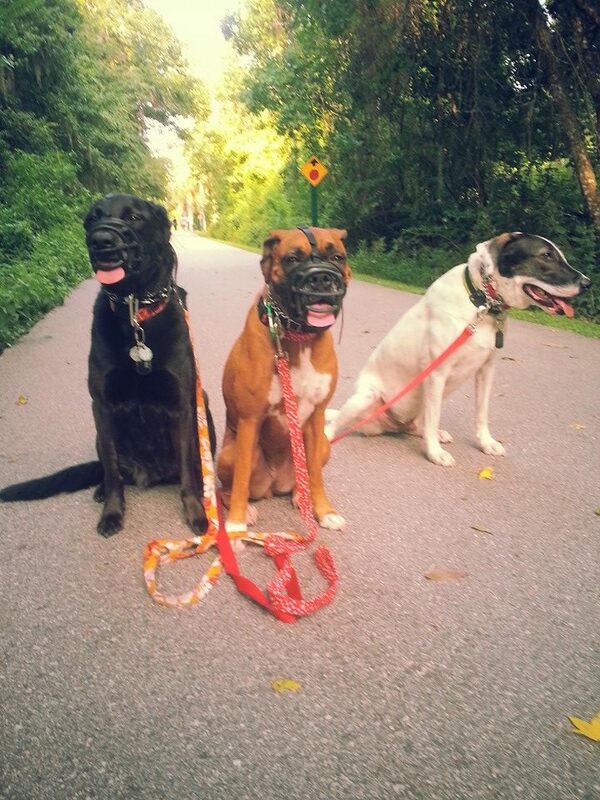 Each dog receives a top-of-the-line Educator E-Collar, as well as a prong/training collar. *Depending on the severity of the issues, additional weeks may be required. This will be determined either after the consultation or early-on in the board and train process. Additional weeks are $975. This unique board and train experience is for puppies between 16 weeks and 6 months of age. Your puppy will live 24/7 in our training program, which includes a lifestyle of structure, routine, socialization, and supervised play. By living at my home for 1 week, your puppy will develop a new foundation and state-of-mind that will make it easy for you to continue training at your home. This will empower you to continue developing a new and incredible relationship with your dog as he/she grows up! Many clients that complete the 7 Day Puppy Board & Train, join us again for another 7 day board and train around 6 months of age to achieve low-level e-collar off leash freedom through e-collar training! This program includes a 30-minute consultation on our starting day, and a 2 hour follow-up at the end of the program where we will transfer all of the information, techniques, and strategies to you to insure continued success. Each puppy receives a prong/training collar. *Up to 2 dogs from the same family can join the program at the same time; cost is $1100 per puppy.